Neck and Throat-Neck rising free and light from the shoulders strong in substance yet not loaded, of medium length. The throat clean and free from folds of skin; a slight wrinkle below the angle of the jaw, however, may be allowable. Defects-A thick, short, cloddy neck carried on a line with the top of the shoulders. Throat showing dewlap and folds of skin to a degree termed "throatiness." Back short, muscular and strong. Loin broad and slightly arched, and the ribs well sprung, giving abundance of lung room. Defects-Very long or swayed or roached back. Flat, narrow loin. Flat ribs. Forelegs-Straight, with plenty of bone in proportion to size of the hound. Pasterns short and straight. Feet-Close, round and firm. Pad full and hard. Defects-Out at elbows. Knees knuckled over forward, or bent backward. Forelegs crooked or Dachshundlike. Feet long, open or spreading. A miniature Foxhound, solid and big for his inches, with the wear-andtear look of the hound that can last in the chase and follow his quarry to the death. There shall be two varieties: Thirteen Inch-which shall be for hounds not exceeding 13 inches in height. Fifteen Inch-which shall be for hounds over 13 but not exceeding 15 inches in height. The hounds must all work gaily and cheerfully, with flags up-obeying all commands cheerfully. They should be broken to heel up, kennel up, follow promptly and stand. Cringing, sulking, lying down to be avoided. Also, a pack must not work as though in terror of master and whips. In Beagle packs it is recommended that the whip be used as little as possible. Master and whips should be dressed alike, the master or huntsman to carry hornthe whips and master to carry light thong whips. One whip should carry extra couplings on shoulder strap. Click Here to Learn about breeder background checks on Beagle breeders if you are looking for Beagle puppies for sale. Click Here to learn how ResearchBreeder.com can help you find healthy Beagle puppies for sale. Click Here to order a Breeder or Kennel Background Check on Beagle Breeders that may have Beagle puppies for sale. 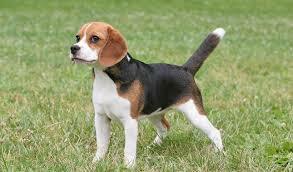 Click here to find the national breed club for Beagle puppies for sale. Click Here to purchase a list of approved ResearchBreeder.com Beagle Breeders who have Beagle puppies for sale.